Free Practice 1 + 2: As usual the Kaufmann Drivers were able to proof their perfomance straight from the first session on. In the first session on the technical demanding track of Nürburgring, Jörg was P 3, Malja P 6 and Tveter P 18. Delétraz unfortunately had an issue on his car. In the second session Gustav Malja was the fastest man on track P 1 overall. Kevin Jörg on P 9, Tveter again P 18 and Delétraz P 23. Qualifying 1: In the first qualifying which was postponed due to heavy fog, Tveter was P 9 in Group A.
Jörg, Malja and Delétraz were in Group B. All three drivers showed a good pace untill 3 minutes to the end a red flag stopped all Kaufmann Drivers which were actually just on their flying laps, specially Jörg who was improving all his sectors and caught the red flag a couple of seconds before the timing line. A very disappointing qualifying in the end with Jörg P 7, Malja P 10 and Delétraz P 13. Overall on the starting grid: Jörg P 13, Tveter P 18, Malja P 19 and Delétraz P 25. 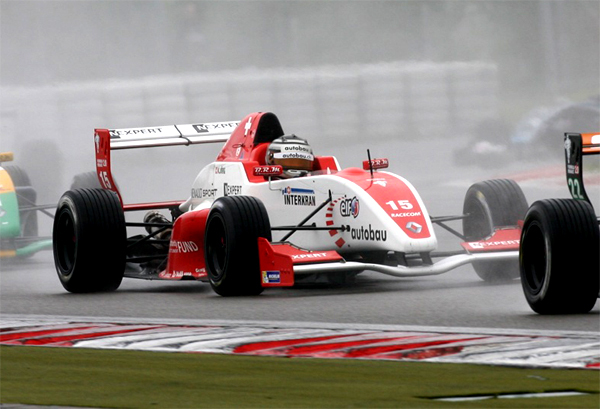 Race 1: In the first race it was very difficult conditions, as it started to rain very heavy. Delétraz and Tveter had problems with those conditions and spun during the race and ended P 23 and P 24. Malja improved to P 14 in the end. 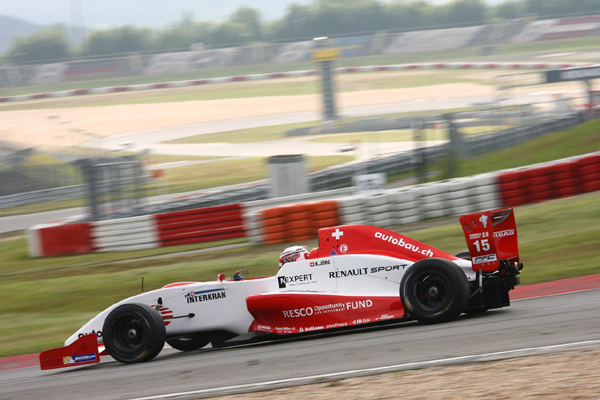 Only Kevin Jörg was able to score points on P 10. Qualifying 2: In the second qualifying on Sunday morning it was raining. In Group B Delétraz was the best of the Kaufmann Drivers on P 4, Malja P 5 and Jörg on a disappointing P 10 only. Tveter finished P 8 in Group A. Overall for the race grid: Delétraz P 8, Malja P 10, Tveter P 15 and Jörg P 20. Race 2: In the second race it was dry track again. Jörg had a good start and moved up to P 13 after the first lap. After a short Safety Car period Tveter spun into turn 1 and rolled backwards to hit teammate Jörg. Both had to retire due to a broken rear suspension. 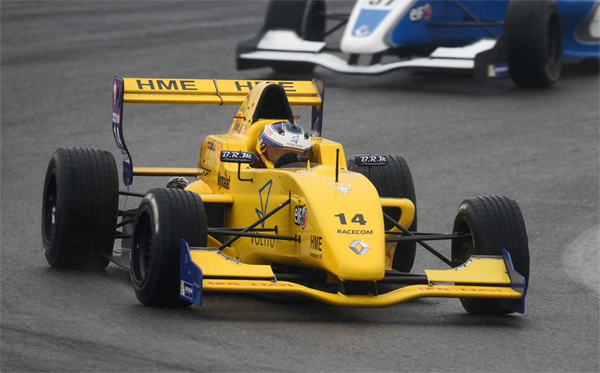 Malja finished the race on P 12. Louis Delétraz drove a strong race and was fighting for P 5. In the end an unlucky overtaking move made him drop back to P 7. Still a very good performance from the yound Swiss.